It's official: Manuel "Mar" Roxas will be the standard-bearer of the ruling Liberal Party for next year's Presidential Elections. After months of plain stalling deliberation, President Noynoy Aquino has finally endorsed the Interior and Local Government Secretary in front of family, friends, LP allies and supporters at the Club Filipino in San Juan. The head of state explained that he chose Mar as his preferred successor because he believes that the latter will carry on with his current "Daang Matuwid" ideology. And while the congregation reveled with the announcement, the whole Twitterverse also made sure it was heard. Although not all were enthusiastic with the development, especially because of one glaring factor. I hear some people say they like Mar Roxas but they're not that much into his future First Lady. As usual, parody sites were at it again. Mar Roxas is your annoying high school classmate who nobody likes yet volunteers to be everything: class mayor, team leader, club president. 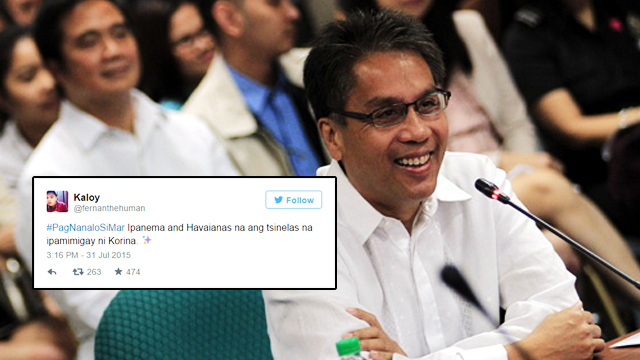 Imagine Mar Roxas doing a Korinaenae. Would you still vote for him? #PagNanaloSiMar ILILIPAT NA ANG "RATED K" SA PRIMETIMEBIDA. Mar's name landing among the top Twitter trending topics made this particular pronouncement seem like a very big deal. Or have people become overly immersed with social media that everyone are required to have their two cents on anything that moves? Bottom line is, we'll just have to see if this social media traffic will translate to actual votes come May 2016.